It’d be great if you could define “category groups” in Koha to allow patrons to easily search multiple categories at once. Until that comes about, how can we approach the problem from the front end? Here’s a little experiment I worked up. This is just a static example page to demonstrate the selections. 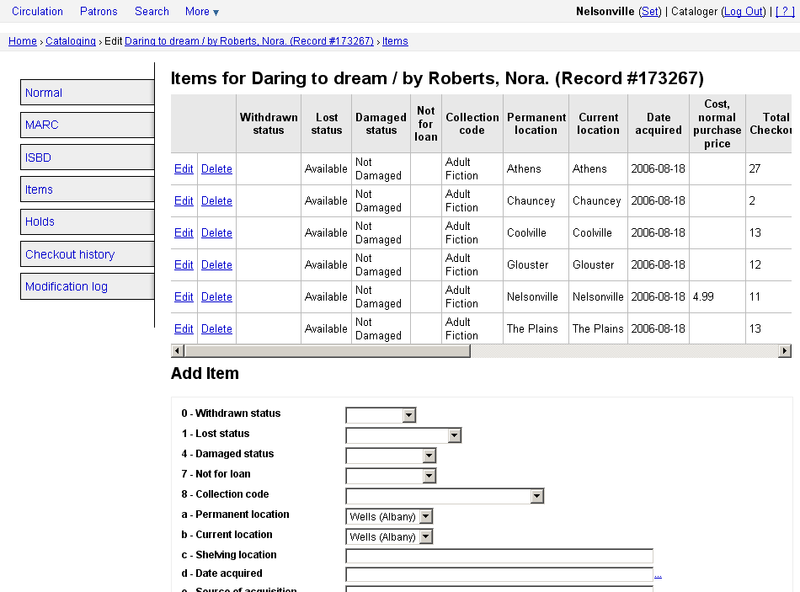 Some parts of the OPAC omitted for simplicity. Try clicking the links at the top of the category table. Clicking “Books” will select all collection codes which I’ve defined as a book for adults. Clicking “Audio Books” will select any category which could be defined as an audio book, whether it be on CD, cassette, or Playaway. Defining your “supercategories” could be as difficult as defining your original categories in Koha. What criteria do you use? Audience? Format? Content? In my example I mix all three. Would that be confusing to patrons? I may yet add this to our OPAC, but I’ll have to ponder these issues a little more. This entry was posted in Koha, Koha Customizations, Koha UI and tagged Customization, jquery, Koha, OPAC, UI on July 16, 2009 by oleonard. 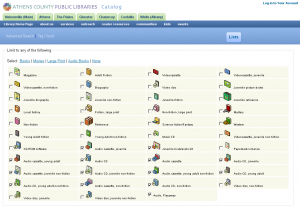 The OPAC’s Cart and Lists buttons are an unusual construction. Their appearance is the result of a rather convoluted combination of CSS and HTML designed to give nice anti-aliased, rounded corners and flexibility when the text is resized. Try increasing the font size in your browser (Ctrl +). The Cart and Lists buttons each have their own ID in the HTML for reference in the CSS: #cartmenulink and #listsmenulink. Let’s look at the Lists button for simplicity’s sake. The image gives the button its border color. The center of the image is transparent. The corners are opaque, colored to match the blue of the default background of the search bar. The corners have to be opaque because they have to mask the square corners of the HTML element behind them. The fact that the corners are colored to match the default background means that if you try to change that background color your buttons will no longer match. At the moment the only solution for those wishing to make changes to the button background is to recreate it from scratch. I’d like to share the source files I’m using so that in the future it’s easier for Koha users to make this change themselves. I use Photoshop 7 much of the time (yes I know it’s old), so I’m offering that version. I also recreated the graphic in Fireworks MX (again, old) and Inkscape .046 (yay, up to date!). Edit the stroke of the button shape (the border color). Change the color of the opaque corners. Our edited button background image gives us corners that blend perfectly with our custom background color. If you’re using Photoshop use File > Save for Web and choose PNG-24 with the Transparency option checked. In Fireworks, your Optimize setting should be PNG32 with the transparent matte option chosen. In Inkscape, use the Export Bitmap option to export the Drawing only. In my tests Inkscape exported the 32-bit version (the version with alpha transparency) by default. What About Internet Explorer 6? Users of Internet Explorer 6 will see a solid-color button with square corners. One major downside of this method of styling the buttons is that it doesn’t work properly in Internet Explorer 6. IE6 doesn’t support PNG files with alpha transparency. The good news is that users of IE6 will still get a usable button. The bad news is that it won’t be very pretty. Using *-border-radius to style rounded corners. Click to view full-size. 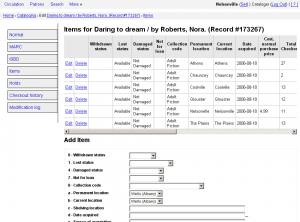 This entry was posted in Koha, Koha Customizations, Koha UI and tagged Customization, Koha, OPAC, UI on July 7, 2009 by oleonard. I often hear people ask if they can have their book covers on the left-hand side of the search results list. This is one of the aspects of Koha 2.x that some people miss. Because the search results are in a table, you can’t simply change something in the CSS to move the images to the other side of the screen. Without changing the template itself, what can we do? After the standard leading “(document).ready” stuff, the script starts by looking for elements inside anything with a class “searchresults.” That’s a <div> that surrounds the search results table. We’re looking for any <td> which is the “last child” of a <tr>. That is, the last table cell in each table row. jQuery’s each() function lets us loop over each instance of those last-child <td>’s that we find and perform some action on it. This is the action we’re performing for each <td> our script matches. “$(this)” is how we identify the matched <td>. Then we use the prependTo() function to “cut” that <td> and “paste” it at the beginning of the row. Notice the element we’re prepending to is “$(this).parent().” parent() selects the element which “contains” $(this): <tr> contains <td>, so we’re moving our <td> to the beginning of the row. Paste the script into your opacuserjs system preference and try a search. It works in my test, but don’t take my word for it. Test carefully and let me know if you see any problems with it. This entry was posted in Koha, Koha Customizations, Koha UI and tagged Customization, jquery, Koha, OPAC, UI on April 29, 2009 by oleonard.